Home Uncategorized New Wedding Bands by Lashbrook! Barbara Oliver Jewelry is featuring a new line of men’s wedding bands. LASHBROOK. They come in a variety of styles and different materials. These are the unique versions that they produce: Damascus, Meteorite, Cobalt, Carbon Fiber, Titanium, Outdoors, Lifestyle, Zirconium, Personalized, Mokume Gane, Hardwood, Precious Metal, and Elysium. Below are a few examples giving you a brief description of the new materials available. Outdoor: For the nature lovers, hikers and campers Lashbrook has the rings for you. 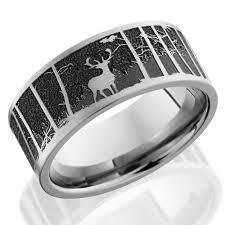 They feature mountains, antlers, moss, forests and their 36 stunning Camo designs for you to choose from. Damascus Steel: An ancient but new in their way of forging metals together to get a distinctive look. This way of making Damascus dates back to possibly Medieval times or earlier to make swords or blades. With this fabrication it create patterns that are beautiful and creative. And no two pieces will be alike. Lashbrook are true artisans in creating these rings. Hardwood: For the guys who want something exceptional these rings are for them. 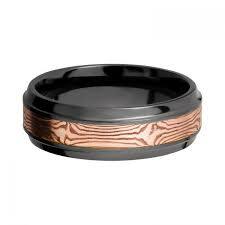 Lashbrook uses Exotic Wood from all over the world. You can choose among 12 species to combine with your favorite metals, style and finishes. Every piece of hardwood is unique which makes each ring one of a kind. Meteorite: Out of this world! A meteor, a shooting star. The rings are made from meteorite that has fallen to earth and cooled for and formed over millions of years. Gibeon Meteorite is known for its striking pattern. Each Lashbrook ring with meteorite will vary slightly and may have inclusions. These rings are very organic! Lifestyles: These rings are custom made with different metals (ex: gold,cobalt) to accommodate symbols that influence lives. 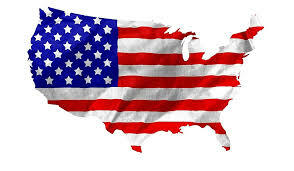 The symbols can be of sports, religious, Unity, music etc. Lashbrook helps you to remember the significant moments in your life with these rings. Zirconium: It is a chemical element and the name is taken from the mineral zircon. It has a silvery-white to grayish patina in its natural state. It has a hard black oxides layer to add to its beauty. 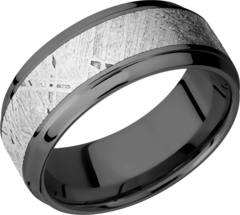 For the gentleman who doesn’t want the traditional wedding band, Lashbrook has that unique ring for you. Mokume Gane: Is a specialty of Japanese workmanship. Metalworking to look like it has wood grain in it. Lashbrook fuses several layers of different colored precious metals to give it its unique characters.